Low Inventory of Existing Homes Continues to drive Prices in ADA and Canyon County Idaho. The continued shortage of inventory compared to buyer demand has pushed the median sales price of existing/resale homes up near the record high in Ada County and set a new record in Canyon County. As of March 2017, the median sales price for existing homes in Ada County was up 8.4% year-over-year, reaching $233,000. 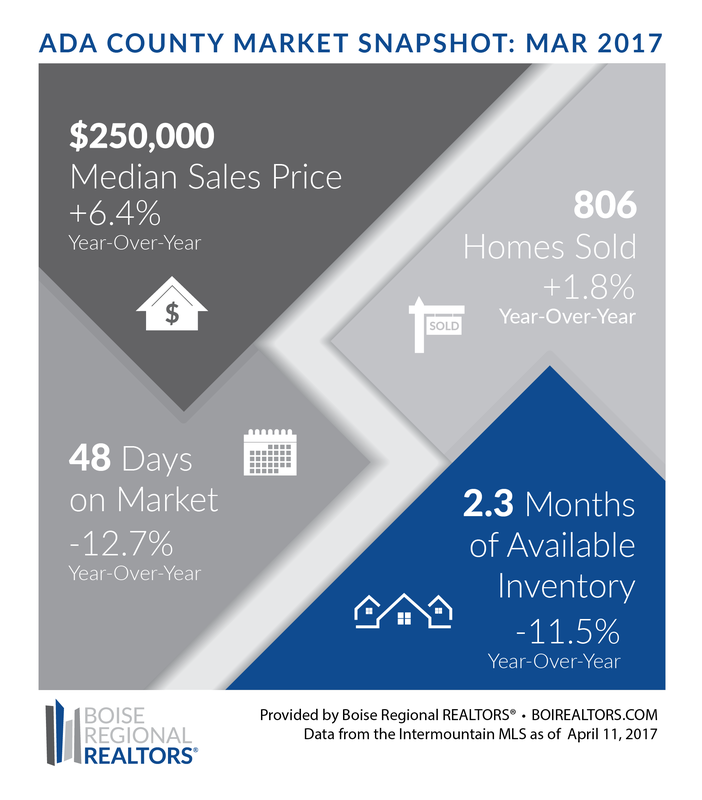 While this was an increase of 5.5% over February 2017, the previous high point was in June 2016 at $239,900. In Canyon County, the median sales price for existing homes reached $164,700, up 10.2% compared to March 2016, and up 4.8% over February 2017. The previous high point was in July 2016 when the median sales price of existing homes reached $160,450. While more existing homes are being listed each month as we move further into the spring market, it’s not enough to keep up with buyer demand. This is especially apparent when comparing current inventory to last year’s levels. The key to fixing the inventory crunch is with homebuilders. They must increase inventory in all prices points to not only help current buyers but also existing homeowners who don’t know where they will move if they sell. As more new inventory becomes available, existing homeowners could move and free up properties in the low to middle price points. Builders know there is demand at all price points and they are eager to meet it. However, in order to be profitable, they often build homes at higher price points due to the constraints of higher material costs, land prices, and the shortage of labor. As existing home sellers are able to net more as prices increase, the hope is that they will choose to sell and move up in price point, especially as there are new homes available in the higher price points.